The back half of 2018 was quite a whirlwind! 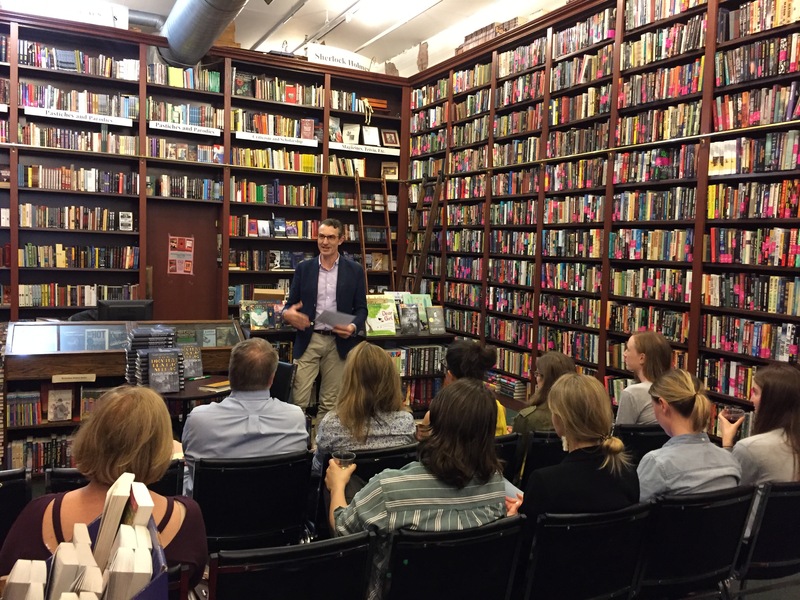 The Devil’s Half Mile dropped on Tuesday June 5, and I went straight into a book tour very generously organized by the Tor/Forge crew at Macmillan. We were in Washington DC at Solid State Books on Tuesday, where it was cracking to meet up with a bunch of current and former colleagues, as well some old friends whom I’d not seen for a while. A great way to start the tour. 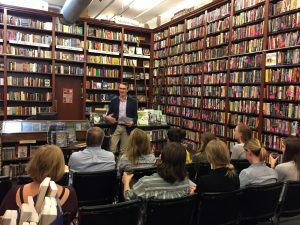 The Mysterious Bookshop hosted me in New York on Wednesday. It was wonderful to be reading in the neighborhood where the book was set, and we had a fantastic turnout. So many friends and colleagues showed up – I’d love to be able to name them all here, but suffice to say I was deeply touched by to see so many people there. I was also lucky enough to be interviewed on Bloomberg anchor Scarlet Fu‘s show What’d You Miss, which was great fun. The Coop on Harvard Square in Cambridge the following night was a disappointment. I’d heard about thin turnouts, but this was my first experience of reading to an almost empty room. I say almost – my profound thanks to Katie Albers for making the trip to see me! The following week I joined Liam Callanan, Sarah Healey and J Courtney Sullivan in Minnesota for two Literature Lovers Night Out dates, organized by the inestimable Pamela Klinger-Horn. We were in Excelsior Bay on Wednesday and Stillwater on Thursday. Two great evenings, topped off with a most enjoyable karaoke session at the High Timber Lounge. After that, it was back to California, starting with a reading at Copperfields in beautiful Healdsburg. I was very well looked after, and it was a pleasure to meet so many friends of my cousin Jeremy Shaw (who operates some very popular wine tours in Europe and South America, by the way). 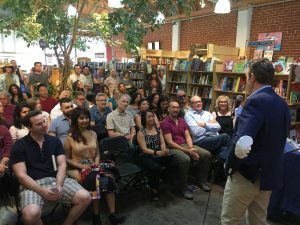 June 26 started a swing through Southern California, opening with a reading alongside Matt Goldman, author of Gone to Dust and Broken Ice, at Book Carnival in Orange, CA. we had a great turnout, and I owe particular thanks to the Kelly family and friends for showing such strong support. 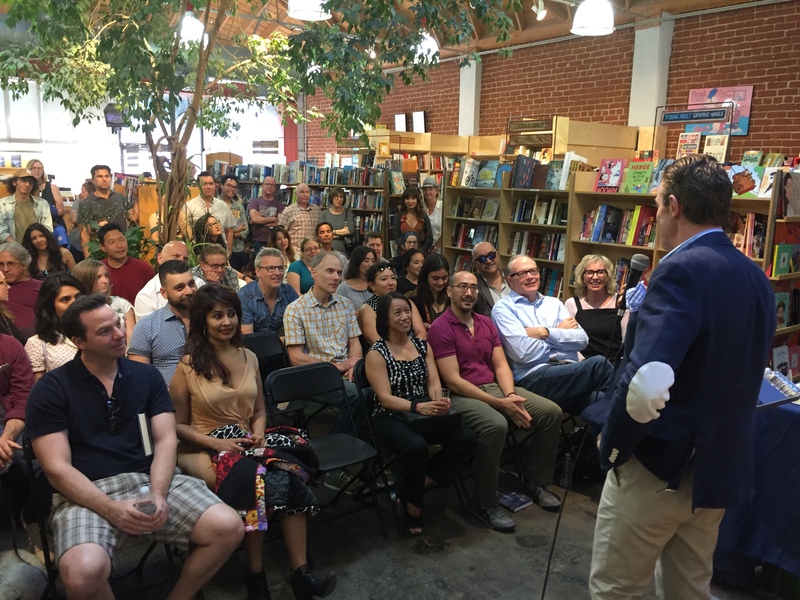 Two days later, I was in San Diego, reading at Mysterious Galaxy alongside Gregory Harris, and we finished the week with an L.A. launch at my local independent bookstore, Skylight Books, in Los Felix. What an incredible turnout! Thank you to everyone who came to see me, and made it such a special day. I was lucky enough to be included in the Debut Authors program at Thrillerfest in New York on July 13. Thrillerfest is a fascinating gathering, where writers really get to connect with the thriller and crime-writing community. Everyone was extraordinarily pleasant and welcoming, and the panels were excellent. The debut authors were particularly fortunate to get some tips from the author Steve Berry, whose advice continues to resonate with me on a daily basis. My publishers at Corvus in the UK arranged a brilliant trip across the water at the end of July. I started in Harrogate, at the Theakstons Old Peculier Crime Writing Festival, which I’d always wanted to attend, and did not disappoint. 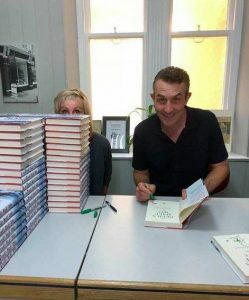 I got to meet so many of my crime-writing heroes and heroines, so it was a great way to start my UK tour. From Harrogate to Dublin, where I was particularly well looked after by Declan Heeney of Gil Hess. They lined me up for a bunch of newspaper and radio interviews, including with Pat Kenny, who made me one of his monthly picks. Declan took me around all the central Dublin bookstores, and set me up with a trip back in time, when I went to sign books in the Gutter Bookshop in Dalkey, just down the road from my old school. I topped off the trip in London, where Corvus arranged for me to sign a whopping eighty books at Goldsboro Books, on Cecil Street in London. They’re all individually stamped and numbered for collectors. It was quite an experience, and made all the more fun by the memoirist Monica Holloway and her husband, F is for Family showrunner Michael Price, who took me for tea afterwards at the Wolseley. August saw me back in San Francisco, where I teamed up with John Copenhaver, author of Dodging and Burning. We talked about writing crime fiction, and read from our books at Green Apple Books on the Park. It was a great night, not least because so many friends and supporters came along – including all seven Thai sisters, and Momma Thai too. Now that was a treat! I’ve always been a big fan of libraries – I pretty much wrote the Devil’s Half Mile in various branches of the Los Angeles Public Library – but I’ve developing a new appreciation of them as a published author. The Huntington Beach Library invited me to read with Peter Blauner and Matt Goldman on September 10, and the Santa Clarita Library invited me to take part in an author panel on September 22, along with Ellison Cooper and Paul D. Marks. Then the Corona Public Library had me to an author lunch on October 20, along with Anthony Tata, Sarah Chen, Ivy Pochoda and Chris Swann. Paul McHugh was kind enough to help me organize a reading at Books Inc. in Palo Alto, where I spent a lot of time when I was at the Knight Fellowship at Stanford University. And I connected with Pamela Klinger-Horn again in October, when she suggested that I take part in a very interesting panel dealing with relationships and money at Modernwell. I was in Singapore in November for the Singapore Writers Festival, where I took part in a panel on historical fiction and delivered a lecture on the beginnings of Wall Street and its symbolism as a divide between rich and poor. I got back just in time to take part in two fantastic events, first the Men of Mystery luncheon, in which more than 20 male mystery writers are assembled in a ballroom in Long Beach, CA. I was a bit nervous about this one, but it was enormous fun. And a couple of days later, I was lucky enough to be invited to an author lunch at the Palos Verdes Woman’s Club, in Palos Verdes, CA. 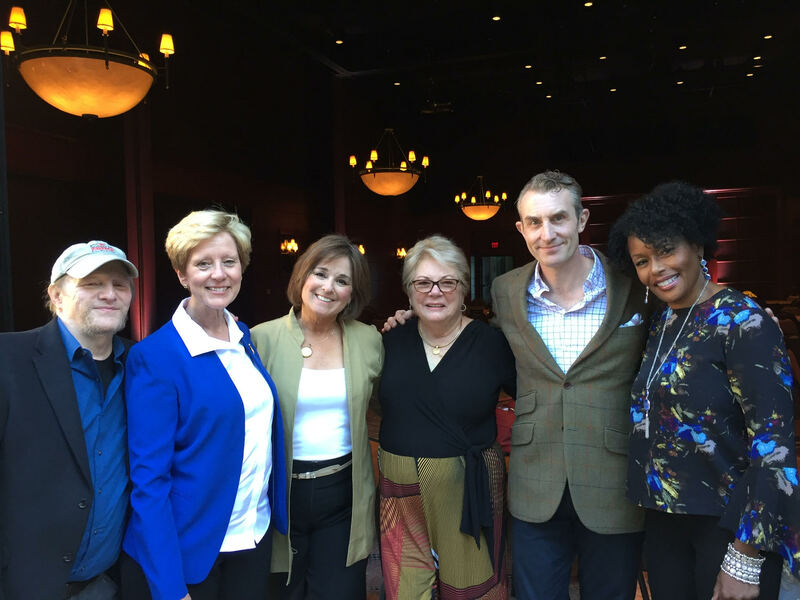 It was a pleasure to reconnect with Paul Marks and Anne Cleeland, and to meet Rebecca Forster and Pamela Samuels Young. They had the most incredible raffle, by the way, and we seemed to have a very lucky table. So if I get invited again, I’ll splurge on some tickets for sure!